Discussion in 'Contrails and Chemtrails' started by Danny55, Apr 21, 2012. I see Al is still at it. He has been fully informed of the false claims he has been making. Be sure to go to page 2 of the above thread to see Big Al's buddy Gianluca Zanna taking a sample of chicken poop in water and calling it rainwater. Al DiCicco updated the description. EVIDENCE DUE MAY 15 2012. This group is for those interested in filing a lawsuit for Geoengineering and Chemtrails that have evidence of Chemtrail toxins such as Barium, Aluminum, Strontium and other toxins in their blood or hair, urine, soil, rain water, we plan file a complaint in all 11 US Federal Courts and Courts abroad. We now have 1177 potential Plaintiffs and we are growing fast now. Thanks to all that have joined. This is global and similar actions may be brought in other countries. Since the group was started, we have since done more testing, rain water was tested and was high in Aluminum and Barium and Strontium. There is an ongoing effort to discredit and placate THE PUBLIC by certain people regarding this issue. Many doctors do not test for heavy metal toxicity on patients. If they don't, I suggest a new doctor. WE HAVE ONE SO FAR AS OF 4-18-2012 in California. His lawsuit, if initiated, will be deemed frivolous and dismissed. My lawyer once said to me, "I'll sue a ham sandwich if you pay me enough." Lawyers will take money for anything. 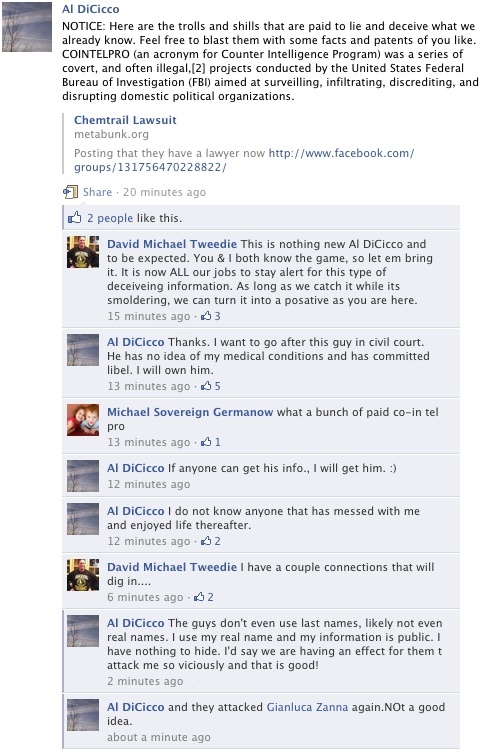 Yelling and screaming "We have a lawyer!" means absolutely nothing. I was sued a few years ago. Totally frivolous. I spent only $1,500 defending myself. The jerk who sued me spent over $30,000 trying to get at me. Ultimately his case was thrown out after the first oral argument before the judge. In the world of litigation, getting your case tossed out on oral argument is essentially calling the plaintiff a total loser. Anyway, my point is, a lawyer taking your money doesn't mean squat. I'm confused, who are they planning on suing? Every government in the world? Plus, don't you need actual evidence to link heavy metals in blood to chemtrails? I imagine they will name multiple defendants: The FAA, The EPA, Various government department, maybe the CIA, several individuals, like the president, etc. I don't think they have really thought it through. The Arizona Department of Environmental Quality, the Mohave County Department of Health, Arizona Gov. Jan Brewer, the Federal Aviation Administration, the Environmental Protection Agency and President Obama could be among the defendants. Al DiCicco is giving the bogus advice about rain water collection again:[ex=https://www.facebook.com/groups/131756470228822/310076425730158/?comment_id=317582991646168]remember when testing rain water. collect in a clean bowl. no runoff from roofs trees ... collect the first 5-10 min. of a rain. before placing into sample container for mailing, shake up the water a bit. heavy metals sink. [/ex]And again, they are testing dust from who knows where. If you want to get correct values for water, you have to filter out solid particles, especially if you insist on taking your sample during the start of the rain which collects all particles (soil dust, soot, pollen etc.) that were blown through the air before. Furthermore, you cannot take any "bowl" for collection. I would choose glass. Mistakes like these would be dissected with pleasure by the opponent's laywers in a trial. The best part of all this is that they will be suing the very people (EPA) who set all environmental sampling standards; with evidence collected using the worst possible sampling techniques. I think the EPA just might have a few sampling experts to counter and poke holes in the piss poor sampling methodology these guys are using. Why do i get the feeling this lawsuit will never get heard in a court of law? I can't see the palintiffs going forward with this case because it would end their crusade with the drop of a judge's gavel. If people are going to continue milking money out of people with this issue they can't take it to court. It will never go forward. It will require money to file it, and 95 percent of chemmies are loath to do anything about "Chemtrails", that does not involve going to message boards and typing LOOK UP, CHEMTRAILS! I remember one of the recently attempts that went nowhere, because while they wanted people to sign onto the lawsuit, that also was going to make them on the hook for the lawyers bill if they lost. It reminds me of the 'Perpetual War' in 1984 which keeps the people believing in a 'war effort', to maintain subservience, and in this case an income. To be honest though, what happens when a key piece of evidence is debunked? The accusers move quickly to other claims, and the debunks are merely juggled around the conspiracy community, with no theory ever able to be comprehensively debunked all in one go. The court case would be juggled/spun/ignored/misreported and the same claims would still be made, with everyone feigning ignorance. That's why large stores like this and especially specific debunking collections like www.ContrailScience.com are so important. All the debunks are presented at once. The theories are logically surrounded, and no option is left but to concede defeat. ... 95 percent of chemmies are loath to do anything about "Chemtrails", that does not involve going to message boards and typing LOOK UP, CHEMTRAILS! Isn't this emblematic of conspiracists? They never seem serious about learning the facts or doing anything about "what they know." Their whole identity seems to wrapped around their self-belief that they know something special. If they were to actually seek out facts or acknowledge they don't have a solution (because there's no problem) they would be lost souls. This makes me wonder if I should extend the politeness policy to people not directly engaged in discussion. I've felt that strident criticism of of people like Michael J. Murphy is reasonable, as they are profiting from pushing the hoax (even if they do genuinely believe in it). But here I'm thinking the insulting criticism is just as unproductive as always - even if were true. Mick and Jay! When are you dividing up the paycheck with us?? Sweet. So he's going to try and get you in court for libel? I'm 100% certain he won't, once he quickly realises that involves having to prove somehow that you're wrong. 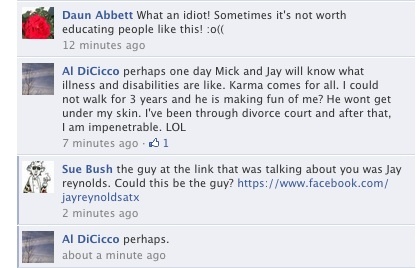 Just enjoying their steady stream of ignorant comment. It's fascinating. Apparently Mick, you're running this blog 'against them'. What gets me is the fact they can't imagine just normal people disagreeing with them. We couldn't have each come to a reasonable conclusion independently. No, we have to all be part of some vast evil agenda. Gee I'm glad he reads this. For anyone else, don't be angry as us for having educated ourselves. The same information is available to all of you for free in any public library around the world. Now all you need is the conviction to learn. Robert, you wrote: "if you know something we don't or would like to discuss in an open forum here, join us and let's get to it." Thank you for extending that offer. I know that some people view debunkers with suspicion, so I'll try to stick to verifiable facts. significant clinical signs or symptoms of barium poisoning "
From a purely factual point of view, if blood tests such as those from Mohave are going to be use in a lawsuit, then there needs to be a strong scientific basis for the claim that the levels are actually above the normal range for human blood. Al Dicicco talks big in front of his friends, doesn't he. Al knows exactly who I am, we have exchanged emails and even spoken on the phone. A year ago I invited Al here for a debate about the issues, but he hasn't accepted the challenge. This tells me that he is aware that what he has been telling people cannot withstand questioning by folks who know what the facts are and that he isn't very certain about what he is telling them. At a minimum, an activist waging a campaign asking folks for money should be confident enough of what he is saying to be willing to debate the issue without resorting to threats of lawsuits. Such threats are actually only a reactionary gambit designed to frighten others from criticism of his claims and throw up a smokescreen so that his followers won't look closely at what he doesn't want them to see. It is a bully's tactic. Well I am glad they are reading this. I have a suggestion that will end the difference of opinions on the subject of Chemtrails once and for all. Instead of sending money to dubious persons or lawyers, pool your cash and pay for an hour or two in a Biz-jet such as a Learjet or a Falcon. Why? All you need to know about how to get a definitive sample of a Con/Chemtrail is that the air inside the cabin of one of these jets is drawn from the outside air it is flying in. It is the same stuff. In fact the pressurisation system will even concentrate the particles found in the air for you. So you don't need any fancy airborne testing equipment; just a few sterile plastic sealable containers to sample the cabin air before you fly into a trail and after. There you will have your incontrovertible proof, one way or the other. The best thing about it is that there is no way to fudge the result. Pick a good day for Con/Chemtrails, ring up your local jet hire company and tell them you wish to go flying. You don't even need to tell them why. This makes me wonder if I should extend the politeness policy to people not directly engaged in discussion. We should avoid "bashing" anyone, directly or indirectly, regardless of any justification. It will just confirm the opinion of those coming by and looking for confrontation. I for my part will try to be careful in that respect from now on. There you will have your incontrovertible proof, one way or the other. We both know the result would show there is no such thing as chemtrails, and unfortunately we both know that such real physical proof would still not convince the nutters. I would think twice about spending your money. Again a reminder that testing water with solid particles in it can not be compared to official values and limits (see post #8). The lab should make you aware of this. Even if the procedure for sampling is followed correctly, you would have to prove that anything found in the rain water originates from the trails as opposed to sources on the ground. Imagine what the opposing counsel would point his finger at. "Levels of Barium, Aluminum and Strontium in the Body... What's Normal?" A: This is the minimum detectable amount for which we will make a report. Q: What does "elevated" mean? A: Any amount above the median (average) amount will be reported as elevated. Q: What does "N-1155" mean? A.: That is the number of people that NMS tested when we were researching average blood barium levels. Q: I am looking at a report of barium in blood, what does the comment "Median, 21 mcg/L" mean? A: 21 mcg/L lies in the center of the range of what 1155 people had in their blood. Q: What does "Range, 0-489 mcg/L" mean? A: That is the spread of blood barium levels that NMS labs found when they tested 1155 average people. The lowest was 0, the highest was 489. Q: What does "10-90% of concentrations range from 1.8 to 165 mcg/L" mean? A: Most people's blood barium levels fall into the range of 1.8 to 165 mcg/L. NMS lab reports say that most people have blood barium levels in the range 1.8 to 165 mcg/L. In average people the full range was from 0 to 489. The National Library of Medicine quotes the Handbook of Toxicology of Metals, 2nd edition, as saying "Normal human blood contains 0.08-0.4 mg Ba/l (80-400 mcg/L)"
Labcorp says "Upper end of the normal range has been reported to be from 2 - 400 mcg/L (NMS Labs derived data)"
NMS says on othe lab reports: "The concentration of barium in normal human blood is approximately 2-400 mcg/L" and "Barium ... usally up to 400 mcg/L blood"
Well it has at least allowed the information on Barium levels in blood to be available to the group, they can do their own research. I must ask everyone to refrain for anything that can be taken as a personal attack. This is obviously an area where people have very strong feelings, and anything that provokes them can greatly hinder communication for everyone. Think you might just be blocked Mick. You're posts are still visible. Usually when I get barred, all my posts disappear. Can you still see the group? 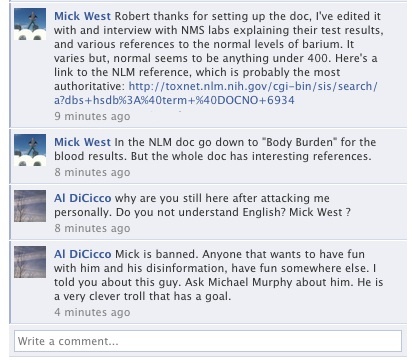 Your info "should" make people do a bit more research into the testing and results, but if Mr DiCicco thinks it is "disinfo" he can surely make a phone call and check for himself. I have a feeling that Al DiCicco may be under some real pressure. The group description states "EVIDENCE DUE MAY 15 2012", and he scolded discussion participants for not taking decisive action and let their blood be tested. [ex=https://www.facebook.com/groups/131756470228822/permalink/321491147922019]I am very, very disappointed and almost outraged that several so called activists have not provided any evidence; no blood, rain, hair testing done at all! !...It makes me wonder why. I don't pull punches. If you are concerned and talk tough, where the hell is your lab results? [/ex]Maybe he is not getting the values he had expected; that might explain at least partly his touchiness when the interpretation of test levels is discussed. It is also somewhat telling that he did not comment on the "What's normal?" thread. I almost feel for him and hope this whole thing will not swallow him completely. If he thinks the traces in the blood are problematic, wait until he talks to a reputable hydrologist about the water samples used. He'll have to account for the geological background of the entire watershed, then all possible other contributors, like mining, industry, and agriculture. If his source is groundwater, he'll have to account all of the above plus the perc rate of a much larger region. Somewhere in my researching, I learned that can be years, decades, even centuries. Really it's 'interesting' the problems these people get themselves into talking about testing anything other than a trail itself. They envision they are somehow harmed, but can't competently explain why. Pure emotional response to something they don't understand. Perhaps they should research the basics of "research"......? Seems like you have been edited out of the document Mick. Most of your posts have been deleted along with any replies from Robert and Al. Reminds me of "The Minstry Of Truth" in 1984. Think we should just let them go ahead and have their day in court after the 15th. Should be interesting to see what happens after they spend their hard earned cash. Orwellian themes are only to be feared if it is perceived as being used by debunkers. When they rewrite history, they are fighting "them"....which I guess is "us". Anything done to fight "them" is okay. Really, someone explained it that way to me. Duplicity is never a good trait. They don't know that. Stars, it's good to see that you are still at it. I have toned it down a bit myself..my disgust for these people has gotten me in too much trouble. Oops...I guess I should tell ya who I am! It's me, faithinscience/maxxewell (and a few others I can't remember). The fact that these people have to manipulate the the truth about how they are received by others says a lot about them. In my opinion, to delete an argument in an attempt to make it look like the argument never actually never happened is the same as lying. These people just can't handle the fact that other people are able to make them look silly and/or ignorant about the trails in the sky. So, they erase such conversations. they have this site collecting all the [public] activity concerning the 'lawsuit'. Register at your peril! I love it...you must first send a sample of something you collect at ground level, and assume came from the trails in the sky, before you can register. I just can't understand why these people can't see how odd these assumptions are. To look up, see a trail, and then assume what you capture in a jar came from the trail is just plain silly! They also have a major problem in that just about all the tests so far are showing perfectly normal levels of the various things that they test for. This is something that Al DiCicco has consistently ignored, but is obviously going to be a major issue in any lawsuit. How can they sue someone for their normal levels of aluminum and barium? How do I change the privacy for a group I admin? Click at the top right corner of the group. Select Edit Group from the dropdown menu. Pick a new group privacy option from the Privacy dropdown menu and click Save. 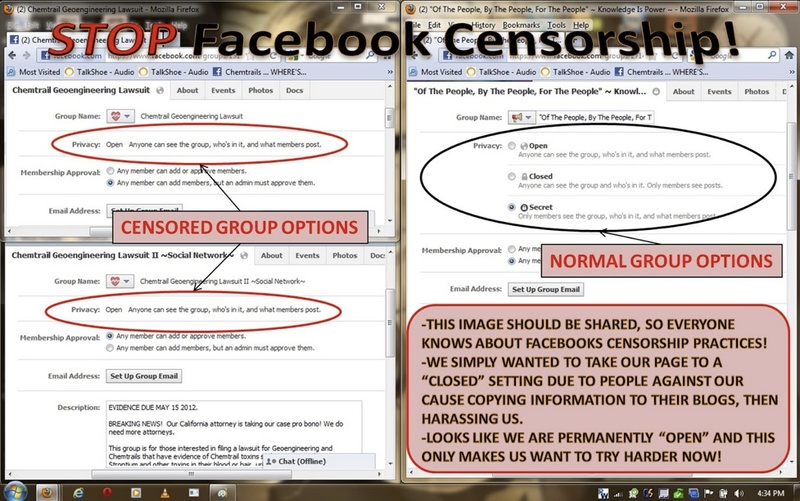 All members of the group will receive a notification that the settings have changed.